The Tamarind Hotel, St. James. 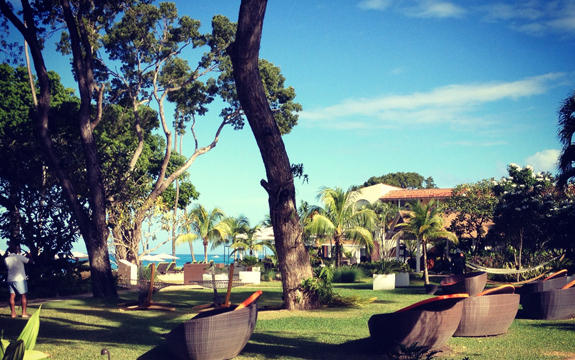 When planning your trip to Barbados, where to stay is just the beginning. For a country that is only 166 square miles, the island boasts a bevy of fine and casual dining options, chic shopping, a variety of sporting and adventure activities and much more. The key to a good time in Barbados is to venture beyond your hotel, condo or villa and Parlour has an exclusive, island-wide hook-up that will have you exploring in style — The Barbados Island Inclusive: The Best of Barbados at The Best Price. Book your island stay at a participating hotel or villa for a minimum of five to seven nights and receive up to US$200 per person to spend however you like at select restaurants, transportation providers and attractions across Barbados. To participate, you must book between April 29 and June 22, 2013 and travel must occur between May 1 and December 21, 2013. Imagine starting your day indulging in a tasting at the Mount Gay Rum distillery, relaxing on an afternoon catamaran ride or traversing on a guided tour of the island and ending the night with an ocean-front dinner at Tapas and using your free vouchers to pay for it all. Considering Barbados for Crop Over season or the Food Wine and Rum Festival? Consider the Barbados Island Inclusive the prize for booking early! Check out the participating restaurants, attractions and vendors here. We’ll be posting Parlour‘s personal recommendations over the next few weeks so check back to get our view on where to spend your free money. Promotion is based on a maximum of two (2) persons per room/reservation. If there are more than two persons in a room only two will receive the cash vouchers. Vouchers totaling US$150.00 per person (Barbados$300.00) will be given based on a five night stay. Vouchers totaling US$200.00 per person (Barbados$400.00) will be given based on a seven night stay or longer. Cash vouchers will be made up in batches of $50.00 and will be the equivalent in Barbados Dollars. Persons can pay any differential for full payment to the vendor with their own cash, but no change will be given back on cash vouchers presented. Vouchers will not be replaced if lost or stolen. Simply book your travel at your desired hotel or villa property and select or mention the Barbados Island Inclusive promotion and you’re all set. Tell them Parlour sent you and then tell us when you’re going by leaving a comment on the site, on Facebook or tweeting us at @parlourmagazine. Be sure to check out our BIM guide at Passport Barbados to help you plan the rest. Happy Travels! Passport Barbados: Let The Fun Begin! I booked through Expedia. Do I just mention the promotion when I check in? Contact PEREIRA TOURS for a variety of fun activities while in St. Kitts.